This is the second of a two part post (see here for part one). IMTFI sponsored researcher Mani Nandhi highlights barriers to mobile money adoption among rickshaw pullers in Delhi by sharing her notes from the field. Kumar cope with everyday debt relations? Vinod Kumar is about 27 years old from Bilheri Village, Chattarpur district in Madhya Pradesh. After finishing middle school he was not allowed to study, so he ran away to Delhi at the age of 16. He became a puller because of his tekedar (rickshaw contractor), who is also from his village. He had tried to open a bank account in his village by providing the necessary documentation (e.g. voter’s ID, ration card) about 3 years ago, but his application was rejected because the fellow villager who signed his application form was not deemed eligible. Vinod could not find another person who could sign for him. When he learned about mobile banking, he was happy that he could open an account because he owned a mobile phone. On 26th October, 2012 he opened his ICICI –EKO mobile banking account with Rs.600 (about US $10). 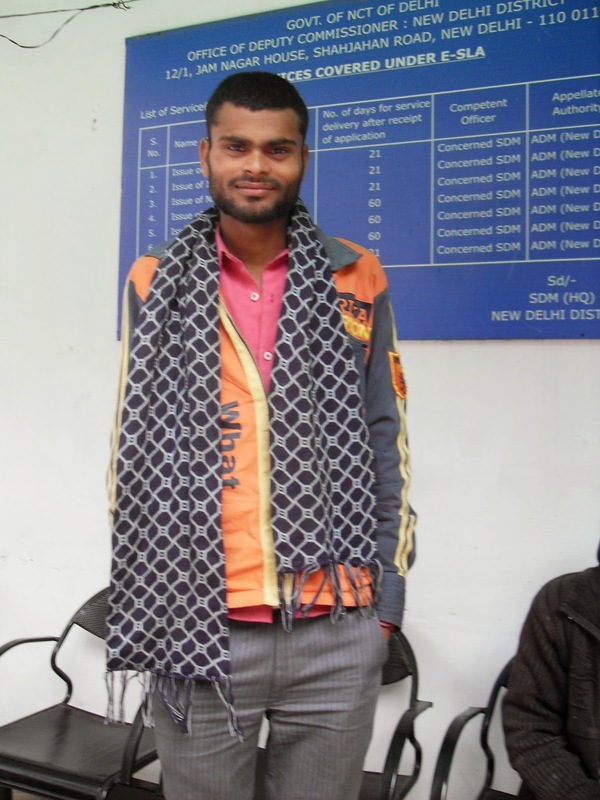 But when I contacted Vinod in December to check his progress, he had lost his phone. Despite knowing that he had to get a duplicate SIM card to access his account using his voter’s ID card, he said that he had left the card in his village and would have to ask the next fellow villager coming to Delhi to get it from his house. As he ran out of excuses, I sensed that there was more to the story than met the eye. Over the course of a number of small personal meetings (in the rickshaw or on the pavement away from his slum where the tekedar kept a watch), I pieced together the story. Gambling with cards was the main issue. He had accumulated a huge debt to his tekedar as well as a few fellow villagers. He plays cards to relax after the working day. He played much more during Dipawali (a major Indian festival of lights) because if you win a card game during the festival the Goddess Lakshmi is said to bestow good luck and prosperity on you. Vinod explained to me that whilst small amounts are taken on a reciprocal basis, bigger amounts of money lent by the tekedar (the rickshaw contractor) or malik (the rickshaw owner) are repayable with interest. For instance, a loan of Rs.1000 (US $17) would have to be repaid in a week's time with an interest amount of Rs.250 (US $4) per every Rs.1000. Vinod's debts totalled Rs.115,000 (almost US $2,000). He said he normally earns about Rs.500 per day, which is his net earnings (after basic expenses and rent for rickshaw) from pulling a rickshaw. So that would mean repaying the debt in 7 to 8 months! When I asked Vinod if he was frightened about such a huge debt, he shot back “Why would I be scared? 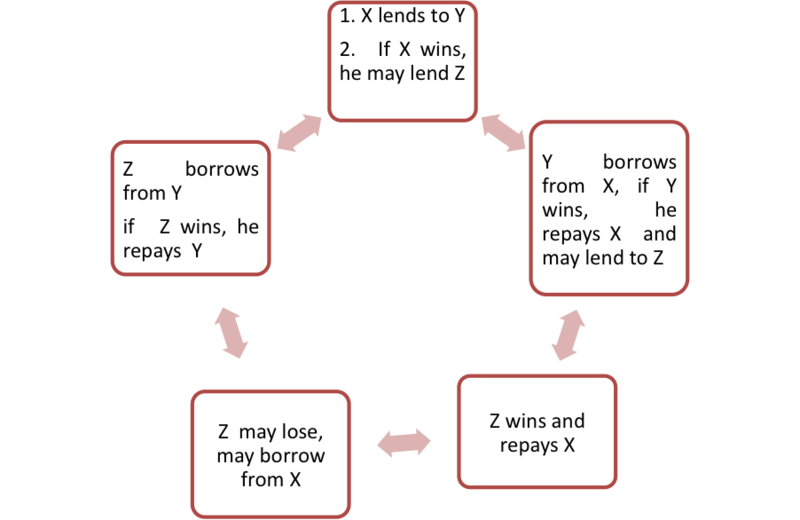 I know I will have to earn and repay if I lose, but if I win I will be able to clear off some debts.” When I asked what he would do if he needed to send money home, his answer was “tekedar will lend for that purpose, if the need arises.” On seeing me shaking my head, he said calmly: “Madam, I have a small diary maintained about my loans,” and he was ready to show it to me. 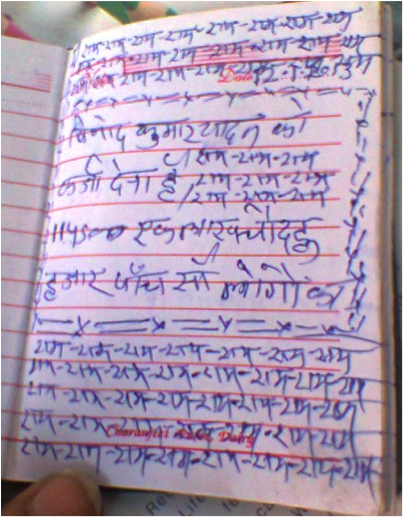 There are eight tekedars in this kandhar (the Hindi term for "wasteland"), and three are frequent lenders. Vinod explained that the tekedars and maliks are happy to lend when the juwa (card games) are on, but rarely lend for other purposes. Many pullers like Vinod deposit their daily earnings from the rickshaw with the tekedar. However, the deposited earnings and the loans are treated separately. The earnings deposited are also treated as collateral when a puller borrows from the tekedar. He said that in one of the games he won Rs.40,000 (US $670). The stake was doubled in the next game by his tekedar, who encouraged him to gamble, and he was unable to resist the temptation. He fell for it and lost Rs.80,000 (US $1,340). He was forced to borrow big sums of Rs.10,000 (US $168) from three tekedars and small amounts from others. Vinod stole Rs.55,000 (US $922) in cash from his brothers at home during his visit for Dipawali, hoping that he would win big in the next game. Now he owes this huge amount to his brothers, too. depending on who wins or loses." Vinod has aspirations, but when gently reminded about saving in his newly opened mobile banking account, Vinod simply said: “How can I think of saving or bother about Rs.600 savings in my mobile banking account when my mind is concerned only with now and only about returning the huge amount I owe people? Such things are far away in my mind now.” His answer echoed his life situation that dangles between desires and actual choices made under harsh circumstances. 1. Link to their full report: Evolving Participatory Relationships for Uplifting the Urban Poor Rickshaw pullers: Next Step Forward.